How Ignoring Freedom to Operate Search could be Fatal? Designing a Product – How Ignoring Freedom To Operate Search could be fatal? You (or your company, for that matter) are working on developing a product. A result of a ton of brainstorming, a dozen or more presentations to senior management, and a couple of approvals – You have high hopes for the product. A significant innovation in your niche, you are pretty sure the sales numbers would break records. You are working day and night on the product, completing every necessary step, except one. You (or your company) did not conduct a freedom to operate search. Missing this one step would have repercussions so fatal, you wish you could time travel to the past and undo this blatant error. What kind of repercussions, you ask? Patent Infringement lawsuits, which could make you pay through the nose, a sum so hefty, your bank account would be short of millions, and in few cases, even result in bankruptcy. You read it right. Bankruptcy. “Can missing one simple step have such harsh consequences”? You ask. Before I go on to explain the reasons why there is an increased need to conduct FTO searches and walk you through a few numbers and highlight a couple of real life examples that highlight how fatal ignoring FTOs could be, a primer on FTO searches, for the uninitiated ones first. What is a Freedom to Operate Search? An FTO study, also known as Product Clearance search is a precautionary measure that can be used by companies to anticipate (or avoid) any future patent infringement. The study provides an opportunity for business owners and companies to avoid infringement by either appointing invalidity searches on the patent posing threat, by implementing design around measures or by licensing patents. All in all, getting an FTO study done could assure launching a product in the market without the fear of having an infringement lawsuit raged against the corporation. Why there is an Increased Need for FTO Studies? The numbers say otherwise. If you’re a startup or an established company entering into a new market, the probability of getting sued for infringement is very high. As per litigation records from the last 5 years, nearly 73% of the companies or startups who try to enter into any market have faced the risk of patent infringement. Yes, the number is pretty huge and there are two reasons that attribute to this statistic. The famous patent strategy book of all times “Rembrandts in the attic”, released on the onset of new millennium, glorified the patent licensing model, while citing the numbers from IBM’s licensing revenue, which at that time was a billion dollar annually. A billion dollars was not a small sum and as the book sales grew, patent strategy quickly became the term C-Suite talked about. It was the onset of a patenting gold rush. 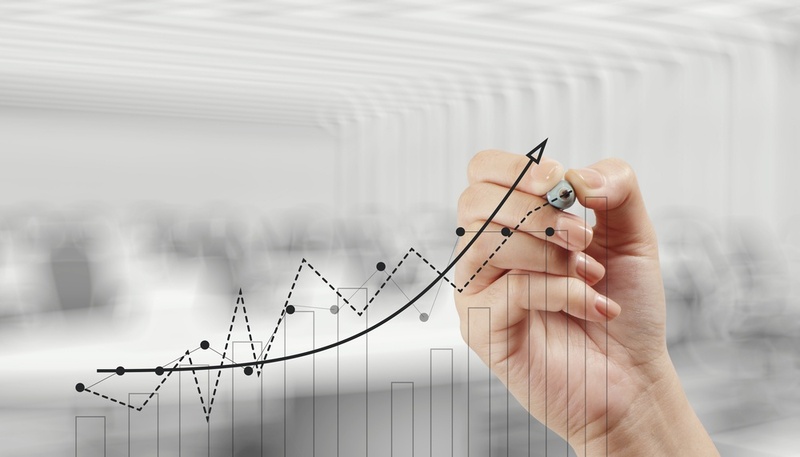 As more and more businesses realized the value patents hold, and the ROI that could be generated, they became aggressive in filing patents than ever before and started spending a sumptuous amount of money on filing patents. To give you a perspective, the number of patent applications filed on a yearly basis in the US has increased from 295,926 applications in 2000 to 589,410 applications in 2015. A 99% increase in 15 years. The patent grants have rose rapidly too. From 175,979 grants in 2000 to 325,979 grants in 2015 alone, about 3.55 million patents have been granted in the last 15 years. “Do these numbers really matter? Should I be intrigued?” I believe that’s what you’re thinking. To answer your questions, these numbers do matter. As it turns out, there is a rough correlation between patent grant rate and patent litigation rate. Though one may not be the cause for the other but, what can be seen is – more the grants, greater the litigation. And it also makes sense, considering patents give its holders a right to exclude others from making, using or selling the technology which results in lawsuits. Makes sense, doesn’t it? 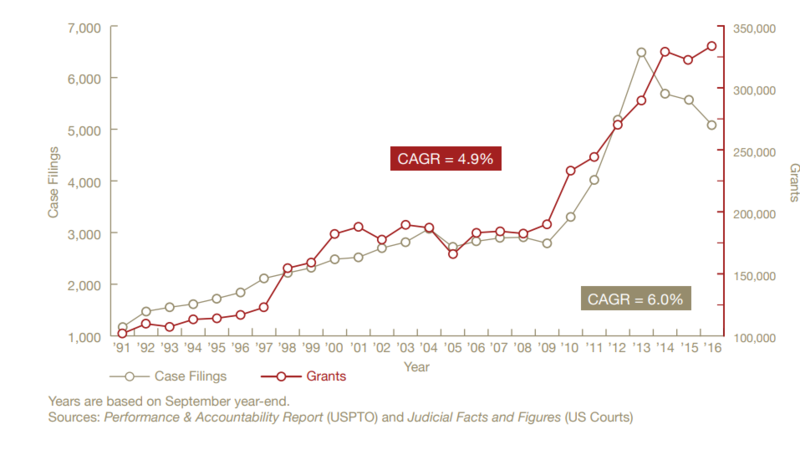 The below chart, courtesy of a recent patent litigation study, clearly illustrates the correlation of grant data with the number of infringement cases filed since 1991. Now some might point that a decline in case filings could be noticed in the past three years, questioning the authenticity of the hypothesis. Given that validating hypotheses is not my area of interest, we’ll leave it for someone else to figure whether there exists any correlation or not between the two data metrics. But the decline in number of cases filed has more than one reason to it, the most significant one being the abolishment of Rule 84 of Federal Rules of Civil Procedure and its use of Form 18, which simplified the process of bringing a suit for direct patent infringement, which was especially useful for small companies and solo inventors. As plausibility standards have heightened, it has become increasingly difficult for small entities – which are a considerable part of the force holding active patents – to practice their right to exclude, thus resulting in a decline. Further, after the supreme court’s decision on Alice Corp. v. CLS Bank, obtaining and asserting software patents have been significantly impacted. Also given how PTAB is known to nix patents that are subject to tests of validity, it quite explains the decrease in the number of cases filed. Having mentioned that, it goes unsaid that not all active patents are software patents. Filed in different niches, belonging to different group art units, protecting every patentable concept, the result of years of research, these excluding rights offer the inventors or assignees a chance to safeguard their technology. Moreover, it is not the protecting aspect but the excluding aspect that yields a high ROI. Patent -> Infringement -> Litigation -> ROI ->File More Patents -> Infringement…It’s a vicious cycle. Realizing this aspect, companies have become increasingly active to figure infringers of their patents. Even a couple of claims if infringed could result in demand letters and impending lawsuits. And, if the threat of being sued by an operating company is not it, a relatively not-so-new NPE business model has further increased the need for an FTO search before launching a product. The patent licensing economy subsequently gave rise to a new type of business model – Aggregators or Monetization entities. Entities who bought patents from inventors- who couldn’t afford the legal fees to enforce their patents- and enforced them on inventors’ behalf, paying them a significant percentage of royalties received. And these aggregators met the exact goal of the patent system. Help Inventors protect the rights over their IP. Of course, they were a boon to the inventors and innovation. But then, a totally different tale took place. Another branch of Monetization entities, notoriously known as “Patent Trolls” were born. These obscure holding companies, also confused with Non-Practicing Entities (NPEs), intentionally filed patents without the purpose to commercialize/practice the idea, or purchased patents, with broad claims at times, claims drafted in a manner such that it became nearly impossible for a product in the niche to not infringe on the patent. Imagine this – You are entering a new niche, ready to launch a product and just when your sales number reached your first milestone, you receive a demand letter claiming that your product infringes on their patent. You have two options – Pay the sum they demanded which is a huge lot, or get ready for litigation. You know that legal proceedings could cost you millions and there is no way you would be on the winning side, despite emerging victorious. So you pay the amount they demanded, which is way less than what you would incur if a litigation is in order. A victory for the troll. Imagine demand letters being sent to 1000s of emerging and established companies. Imagine the practice not being merely limited to NPEs anymore. Well, that is quite the truth. Operating companies jumped in the wagon too. As corporations with huge portfolios wanted to get their hands on more licensing royalties, they indulged in the same practices, sending demand letters to companies threatening litigation, if royalties were not paid. One of the examples of operating companies displaying this behaviour is IBM. Way back in 2013, three days before Twitter’s IPO, IBM sued Twitter for infringing on three of its patents. To avoid litigation, Twitter finalized a deal with IBM at the end of which, it acquired 943 of IBM’s patents, for defensive purposes, for a whopping $36 Million. Pretty strategic move and timing isn’t. PS: If you’re thinking spending $38K for a patent is quite reasonable if you’re going to make money out of it, you’re quite wrong. The defensive portfolio acquired by Twitter, no matter how valuable or expensive, serves zero purpose as Twitter made a move, which would result in the company getting a Zero ROI from its portfolio. What move you ask? This piece would divulge the secret. But as they say, if you are in a forest, you should at least have a strong defense if you wish to survive. Moreover, according to a report by IAM blog, IBM has sold 15000 patents since 1991. how many of those transactions were a result of infringement claims and demand letters, remains unknown. IBM is not the only company known for asserting its patents to make licensing revenue. Major tech giants including Qualcomm, Microsoft fall into this list too. Troll-like behaviour displayed or not, these companies would not let an infringer get away without paying a price for infringing on their patents. So, with operating companies and NPEs both using their patents as swords, what could put you at danger? Failing to conduct FTO searches in an IP-intensive economy where leveraging IP is considered not a mere money-making tactic but a legit business strategy could be extremely fatal for your business. Like Astroturf – An innovator in its field, Astroturf ended up becoming bankrupt after getting sued for infringement, only because they made one mistake. The Tale of Astroturf’s Bankruptcy-How Ignoring FTOs proved Fatal for Inventor of Synthetic Grass? The Ford foundation conducted a study to figure ways to improve the physical fitness of young people. During the study, one observation stood out from the rest, courtesy of Korean war. It was noticed by the U.S. Army, who were allies to South Korea, that urban recruits were less physically fit when compared to rural recruits. One possible explanation attributed was the lack of open space, dearth of fields and playgrounds in urban areas, which resulted in urban men being less fit when compared to rural brethren. Dr. Harold Gores, who headed the Educational Facilities Laboratories – which was created to figure solutions to problems identified in the ford study – decided that if he couldn’t actually make a tree grow in Brooklyn, he could at least get somebody to make him a counterfeit countryside. Gores challenged Monsanto, a chemical company back then, to develop the perfect urban playing surface. During the same time, The Chemstrand company, a subsidiary of Monsanto Industries, were developing new synthetic fibers for use in carpeting. From 1962 to 1966, the creative products group worked on creating the new playing surface. The idea was to make an artificial playing surface for sports that wouldn’t require the extensive maintenance typical grass surfaces needs. The surface was tested for foot fraction, weather draining, flammability and water resistance. The product which was named as “ChemGrass” met the expectations of Dr.Gore. In 1964, the synthetic turf was first installed at Moses Brown School in Rhode Island. In 1965, when the Astrodome baseball field was built, the Houston Astros organization began investigating artificial surfaces to replace natural grass on the indoor field. The astrodome brought Monsanto in to install ChemGrass. The synthetic Turf suddenly gained mass attraction and to capitalize on the popularity, ChemGrass was rebranded as Astroturf. Astroturf, in 1967 patented the synthetic turf titled Monofilament of Ribbon Pile product. In 1986, Astroturf Industries, Inc was formed. Astroturf went on to enjoy the position of Market leader in Synthetic Turf Industry for almost another decade with nine patents in its portfolio. While Astroturf was at the zenith of the niche it had a lion’s share in, despite innovating, it overlooked the protection aspect of product development. The players were many, competition became intense, and the money was huge (An average quote of installation for a football field being $380,000). According to the complaint, Astroturf’s products willfully infringed FieldTurf’s patent US6723412 titled Synthetic turf, which covered in its claims a synthetic material, which incorporates a dimensional relationship between the height/length of the ribbons, the spacing (“gauge”) between rows of ribbons, and the depth of the infill relative to the height/length of the particular ribbons. The complaint stated that almost every Astroturf’s GameDay product infringed on the ‘412 patent, and FieldTurf requested for a reasonable royalty and injunctions to be levied against AstroTurf. 5 years down the lane, after a month-long proceeding, on October 9, the court awarded FieldTurf $30 Million – $20.3 Million in lost profits and $9.7 Million in Royalties. Astro Turf opposed the ruling. Now, for a judgment to stay pending appeal, Astro Turf had to pay the court a bond. But it was not that easy. The expenses of the court had already taken a toll on AstroTurf and the company still owed nearly $38 Million to its majority equity holder. As a result, Astro Turf filed for bankruptcy and was later acquired by SportGroup for $92.5 Million. A company that was a pioneer and led the innovation of Synthetic Turf Domain, half a century later, ended up getting bankrupt. The company failed to evaluate existing patents that might get infringed by their products. The ‘412 patent, though strong, was not difficult to design around. In fact, most (read 60%) of the patents can be designed around, without much trouble. That’s patent strategy 101. All it required was one simple intermediate step before launching a product. A Freedom to Operate Search. I wish they taught that in school! Infringe a University’s Patent – Thou shall pay for it! Talking of schools, universities are not their forgiving self when patents are infringed. Not meaning to sound like a broken record, but as universities have begun to realize the value IP holds, the licensing department at universities have only been busier. In fact, according to a guest post on IAM blog by Fatih Ozluturk, an uptick in patent cases filed by universities could be expected in near future. All are equal in the eyes of universities, companies small or big. Even a tech giant like Apple was not spared for infringing on a patent owned by the University of Wisconsin-Madison’s Research foundation. In an recent judgement, a federal judge in Madison ruled in the university’s favor ordering the Cupertino based company to pay $506 Million- double the amount the jury originally decided a couple years ago, to include ongoing royalties for Apple products sold with infringing patented technology. Getting away with infringement is not an option anymore, no matter who’s patent your product overlaps with. There is only one way to escape litigation and all the trouble that comes with infringing. And you know what it is. Freedom to Operate Searches have become more important than ever, as companies have realized the value of IP as an asset that could fetch a ton of royalty dollars. Skipping this intermediate step can prove extremely fatal and even might leave some on the brink of bankruptcy. Let me rephrase it a bit in the current context- To emerge as winner in every battle, it is important that you know your products and know their patents and make sure your product does not overlap on anyone of those patents. And how do you achieve that? You go the FTO way. Authored by: Anjali Chopra, Analyst, Market Research and Nikhil Gupta, Manager, Patent Search Team.